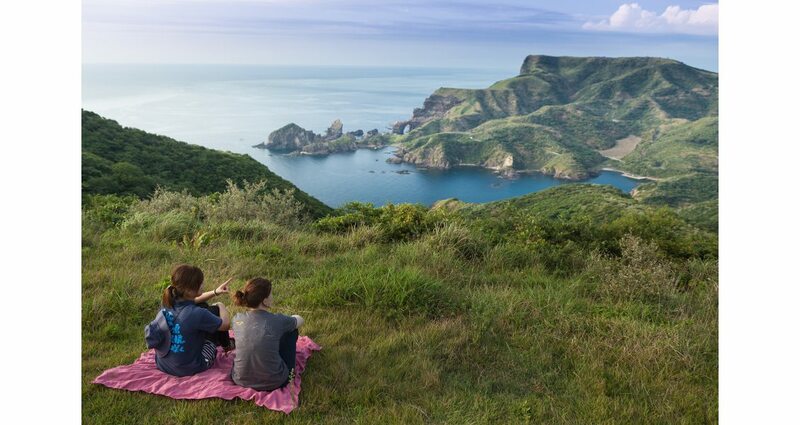 A well-kept secret in the Sea of Japan, the Oki Islands Geopark is transforming the outlook of remote islands and developing new prospects for sustainable geotourism. UNESCO Global Geoparks are often found in remote locations around the world, and the Oki Islands UNESCO Global Geopark is no exception, consisting of a group of isolated islands located in the Sea of Japan, between the Japanese Archipelago and the Asian Continent. 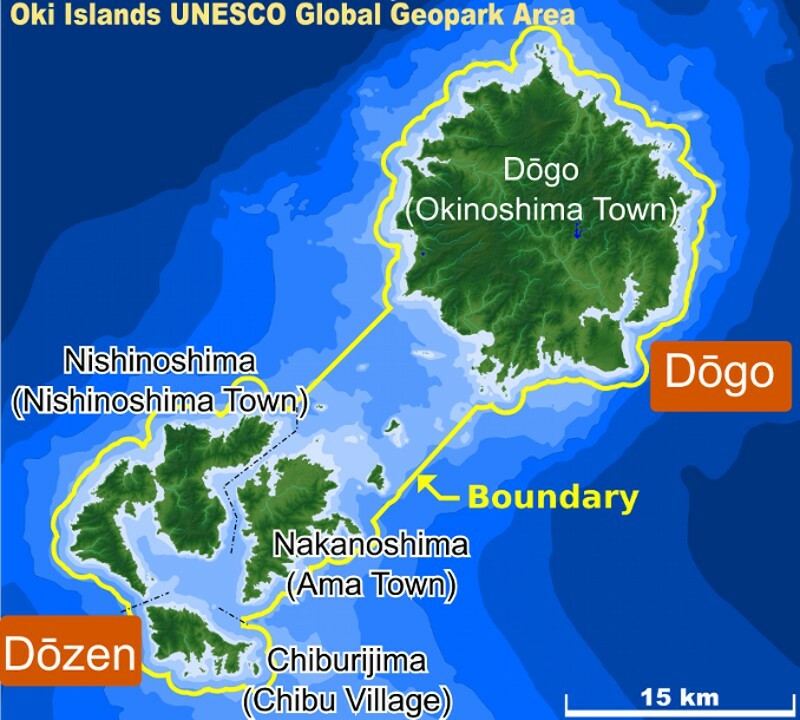 The geopark has a total area of 673.5 km2 and encompasses four inhabited islands - Nishinoshima, Nakanoshima, Chiburijima (the Dozen Islands) and the larger Dogo Island - as well as numerous uninhabited islands and a sea area stretching 1 km from the coast. This distant island group makes a stark contrast to the sprawling crowded cities that may come to mind when one thinks of Japan. With a population of only around 20,000, the islands encompass vast and untouched nature, coasts dotted with tranquil fishing villages, and a rich cultural history. Alongside idyllic island scenery, the Oki Islands feature impressive geological features that tell a story much greater than the formation of the islands themselves. The landscapes of the Oki Islands are quite unlike those of the rest of the Japanese mainland and surrounding islands. They reveal an unusual combination of geological features that tell the story of the formation of the Sea of Japan. A marginal sea surrounded on one side by the Asian continent and on the other by the Japanese Archipelago, the Sea of Japan was formed by the back-arc spreading of the continental plate from around 26 to 10 million years ago. Lacustrine shales. (Source: Katsushi Moriyama) Records of the expansion of the sea can be found in the rocks of the Oki Islands, which are separated into two main areas: the three Dozen Islands, and the largest island, Dogo. These islands were created by vigorous volcanic activity via two large volcanoes around seven million years ago which also uplifted the basement rock, comprising Oki gneiss, a metamorphic rock that formed on the eastern margin of the Eurasian continent 250 million years ago, long before the opening of the Sea of Japan. This rock, often referred to as the ‘backbone of Japan’, is a precious piece of history revealing the continental origin of the Japanese archipelago and the fragmentation of the continent. 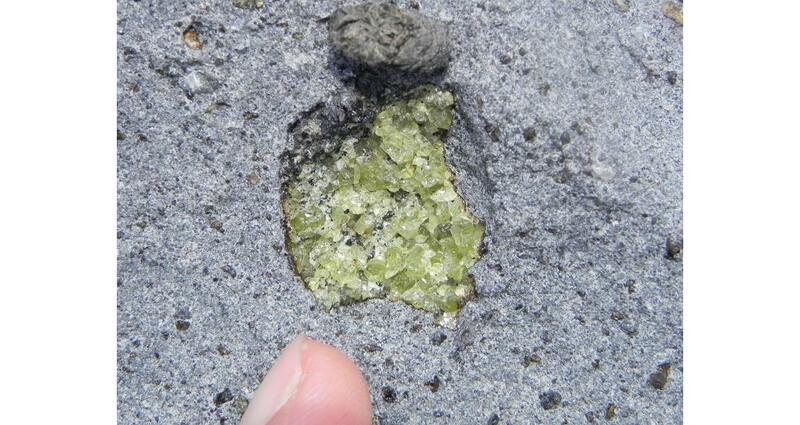 Oki gneiss is easily visible in an exposed outcrop in the largest mountain of the islands, Mt. Daimanji, on Dogo Island. 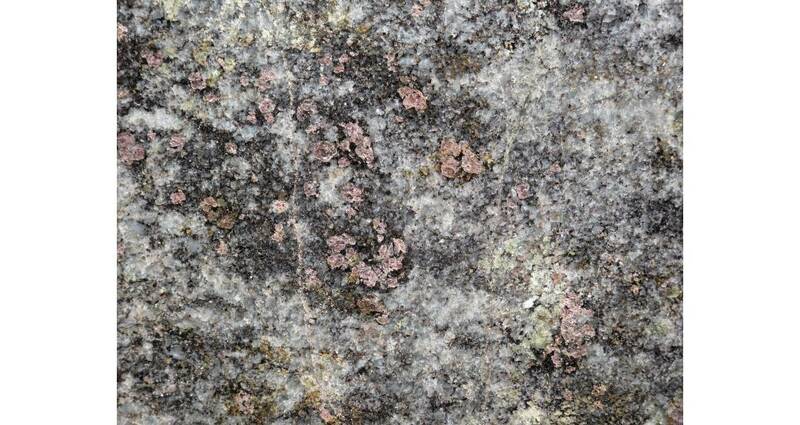 In the polished surface of the cliff face visitors can admire the black and white banding and mineral crystals such as garnet within the rocks. Besides Oki gneiss, lacustrine and marine deposits found around the geopark record the stages of formation of the Sea of Japan and provide important information about the environment at the time. One particularly scenic site on the Jodogaura Coast in north-west Dogo Island features sediments that were deposited in a huge lake that formed on the continent around 26 million years ago. 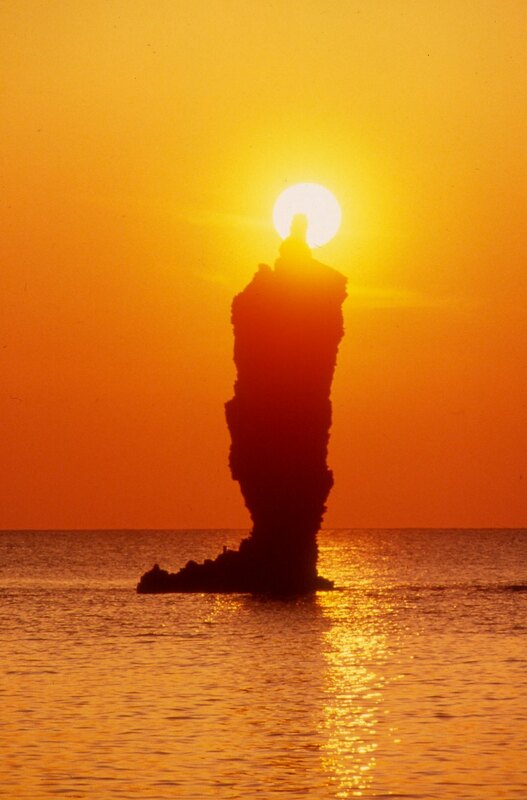 The aptly named Candle Rock (Rosoku-jima in Japanese) appears lit by the sun at sunset. (Source: Oki Islands UNESCO Global Geopark) The powerful volcanic history that formed the islands can be observed in the awe-inspiring indented coasts of the islands, which are continuously transforming under heavy erosion from the sea and strong north-westerly winds from Asia. These coastlines are text-book examples of coastal erosion, with vast sea cliffs, eroded archways, sea caves and strangely shaped stacks, all in close proximity. One distinctive rock in Dogo Island is shaped remarkably like a candle and can be seen lit by the sun at sunset from sightseeing boats. Twelve kilometers to the west of Dogo, the massive sea-cliffs of the Dozen Islands expose incredible views of the cross-section of a volcano, such as Sekiheki (Red Cliff) on Chiburijima Island or Matengai Cliff on Nishinoshima Island. A spectacular walking track will take you from the top of Matengai Cliff, through open pastures with horses and cattle and down to a magnificent eroded arch called Tsutenkyo on the coast. The high pastoral landscapes on the mountain tops of these islands are still used today as grazing land. The undulating fields are remnants of a rotation farming method developed on the islands to maximize the use of the steep terrain and thin soil. You may find some stone walls that were used to mark out the fields up until the mid-20th century. Evidence of another type of volcanic activity that occurred here can be found on a nearby uninhabited island, called Kuroshima, or Black Island. This island contains abundant mantle xenoliths, which are fragments of the upper mantle brought up from a depth of more than 25 km beneath the Earth’s crust during eruptions of basaltic lava. These mantle xenoliths are exposed in the cliffs of the island, but are also commonly found in pebbles and rocks washed up on the beach, so they tell us about the internal structure of the Earth’s mantle while we are strolling along the beach, and are commonly used in Earth science education and tourism. Another important geological asset of the islands is the presence of ‘volcanic glass’, obsidian, one of the major materials used to make stone tools in the Paleolithic. Though obsidian can be found in numerous areas of Japan, in only a few places was it mined and used to make stone tools. 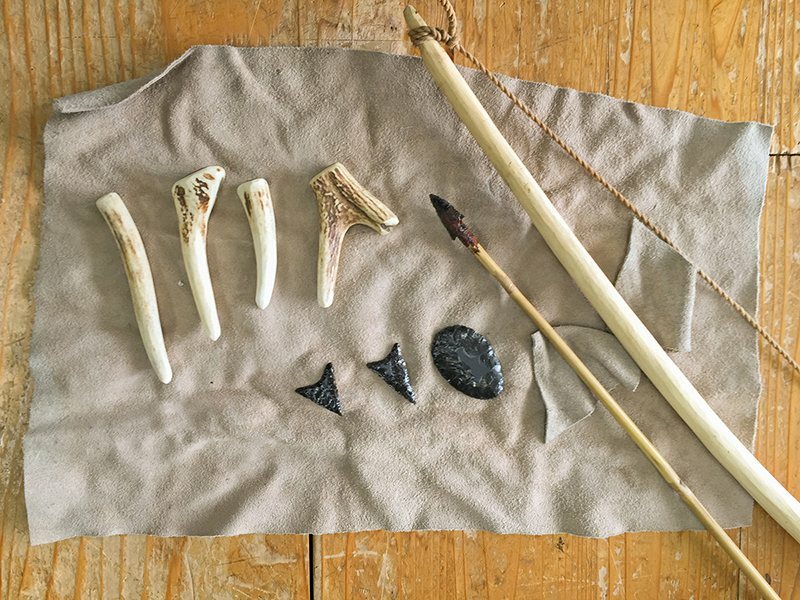 Obsidian Stone tools. (Source: Oki Islands UNESCO Global Geopark) Artifacts of stone tools made with Oki obsidian found across the mainland of Japan tell us that it was a highly valued resource that was traded widely up to 30,000 years ago. Today, obsidian fragments and outcrops can be easily found on the north-west and southern coasts of Dogo Island. Visitors can participate in educational obsidian arrowhead-making experiences, or simply have a chat with Mr. Yawata, who facilitates research of archeological sites around the obsidian outcrops and has a permit from the Ministry of the Environment to mine a small amount of obsidian every year. In general, culture and traditions on the islands have been preserved with little influence from outside, and a number of unique or rare festivals and ceremonies can still be observed here. Moreover, the mountainous terrain of the islands has preserved a cultural diversity within the islands themselves, and one can find a multitude of different festivals celebrated in the villages around the islands today. Numerous shrines date back over 1,000 years, including primitive tree shrines still preserved in the forest. Closely connected to the geological history of the land is the unique ecosystem found on the islands. Though they are isolated, the stretch of sea between the islands and the mainland is less than 100m deep. As a result, the islands have been connected to the mainland during glacial ages a number of times throughout history. The unusual distribution of southern and northern plants found on the islands, including the presence of subalpine plants in coastal areas, is a remnant of the most recent glacial age which occurred 20,000 years ago. Alongside this, a number of endemic plants and animals have evolved in isolation on the islands, such as the Oki salamander, the Oki hare, and the Oki rhododendron. 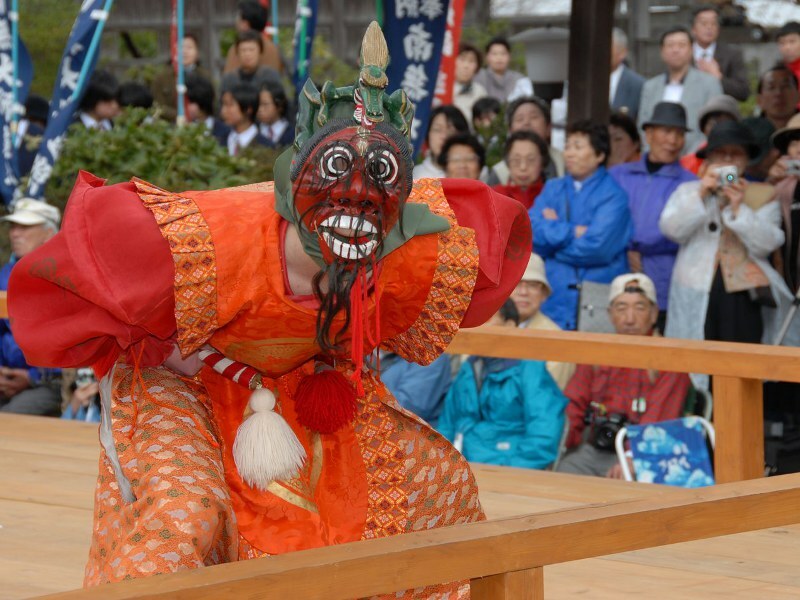 Renge-mai Court Dances are performed at Kokubunji Temple in Dogo Island during a festival in April every year. They originate from the Heian Period (794–1185). (Source: Oki Islands UNESCO Global Geopark) The Oki Islands Geopark developed from a grassroots ecotourism initiative called the ‘Kaze-machi Kaido Club’, and was designated as a Global Geopark in 2013. The work of the geopark is changing the way that local people and visitors view the islands, and paving the way for preservation and a holistic and sustainable use of their geological, biological and cultural resources. Like many remote areas around Japan, the islands show a rapid decline in population and visitor numbers. Consequently, one of the core goals of the geopark is to help create new employment opportunities in the areas of tourism, preservation and education, and to promote the islands both domestically and internationally. 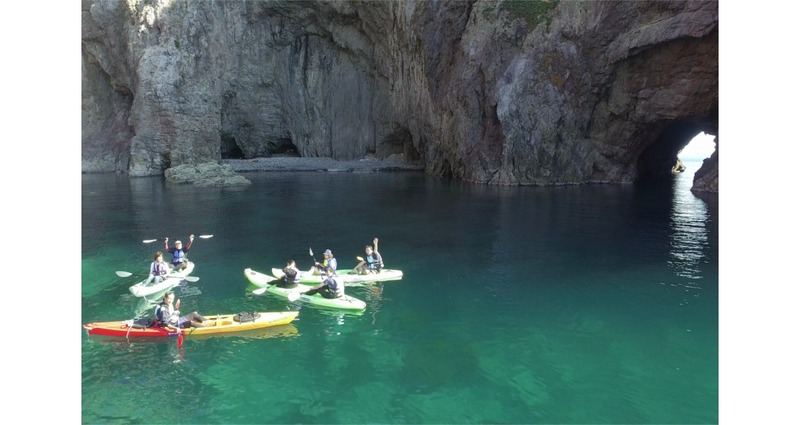 Thanks to the work of the geopark, visitors and local residents can discover the story of the Earth that this region has to tell, and experience the stunning landscape through geo-tours, trekking, or geo-seakayaking tours, accompanied by qualified geopark guides. 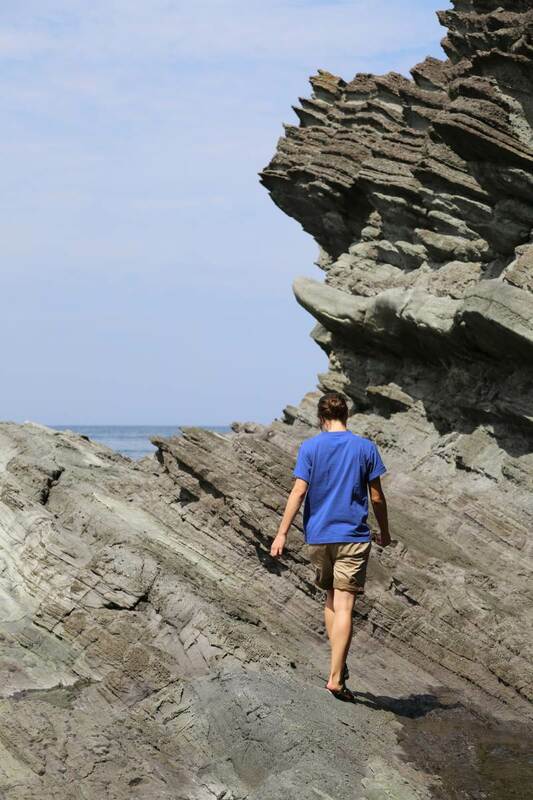 Self-guided visitors can also enjoy the geopark with signboards, maps, walking trails and other facilities. The slogan of the geopark is ‘Discover Connections', as the connections between the land, nature and culture to be found here are infinite. 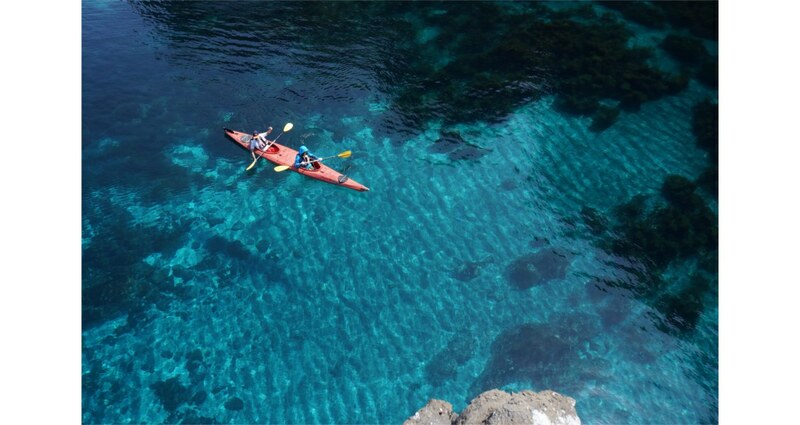 Why not come to the Oki Islands to discover some of these connections for yourself? Though remote, the geopark is easily accessible by air and sea. A daily flight with JAL Airlines departs from Osaka Itami Airport and Izumo Airport, and the Oki Kisen ferry liner services a ferry and jetfoil fast ferry from the ports of Shichirui and Sakaiminato in Shimane and Tottori Prefectures. The islands have a mild climate and are well-suited to tourism from March to November. Qeshm Island: Geoheritage Pearl versus Gasfields in the Persian Gulf? The Kimberley National Landscape of Western Australia. Wilderness, adventure and dinosaurs are waiting for you! The world’s first national park established a new concept in preservation and protection of special areas for future generations. Now, 140 years later, millions have benefited from the founder’s foresight and can enjoy seeing half of the earth’s geothermal features, jaw dropping scenery, and abundant wildlife in Yellowstone’s nearly intact ecosystem.